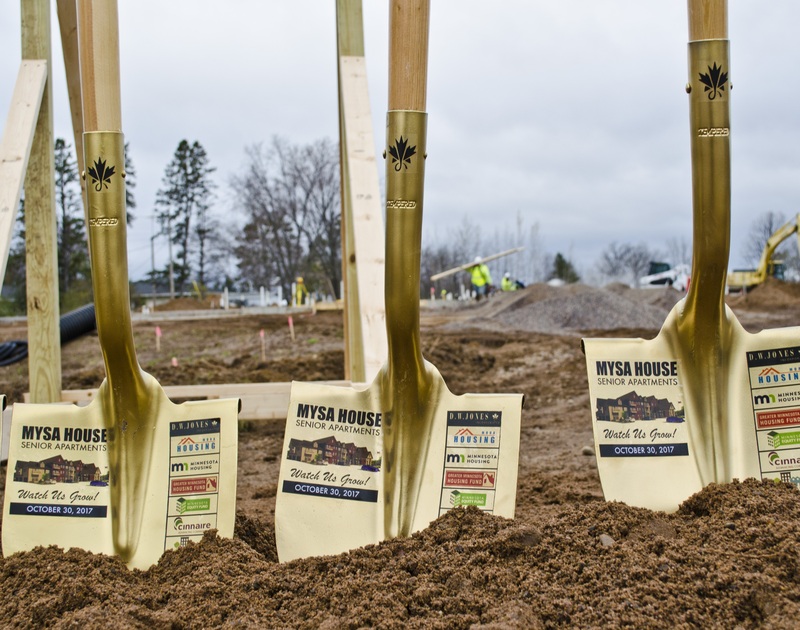 Greater Minnesota Housing Fund and Minnesota Equity Fund joined developer D.W. Jones, Mora Housing and Redevelopment Authority, Cinnaire, Minnesota Housing and other project partners to celebrate the start of construction of Mysa House on Oct. 30, 2017. The day was an early celebration of the 24 units of affordable senior housing that will soon grace a beautiful site in Mora, Minnesota. There are already over 40 low-income seniors on the waiting list for the yet-to-be constructed housing, a testament to the need for additional affordable housing options in the community. Greater Minnesota Housing Fund provided a $535,000 deferred loan to support Mysa House. And Minnesota Equity Fund and its strategic partner Cinnaire provided an equity investment of $1.2 million in private capital, overcoming uncertainty around potential federal tax reform to put financing together for this senior housing. For more information about the development of Mysa House, please see the Minnesota Housing Partnership blog about the facility.